Two areas in which I have done quite a bit of research are robotics and telepresence. Both industries are slowly advancing in financial viability due to a wide array of reasons including culture shifts, increased communications technology, and a rise in robotic research and functionality. There are many factors which make targeted product development a viable endeavor including timing, research into past failures, and recognition of societal signals. In the following sections I will elaborate on the viability of telepresence robotics and the ideas which could make it an attractive emerging sector. Telepresence is probably better known as video conferencing. 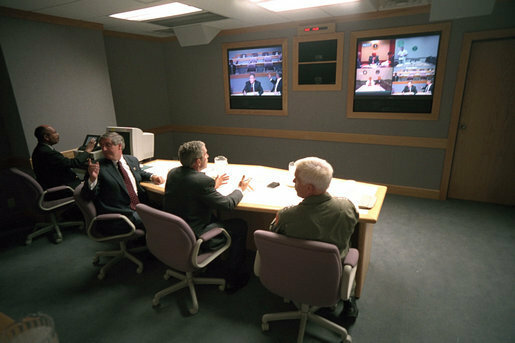 Both attendees of a telepresence session are able to simultaneously view each other on a monitor and can hear each other as they speak. You can normally find commercial video conferencing systems that have entire rooms dedicated to them in larger organizations and colleges. Many of the business grade telepresence platforms utilize special hardware from vendors such as Polycom or Cisco. However, it is possible through software with a reasonably fast internet connection to use a standard computer for telepresence. 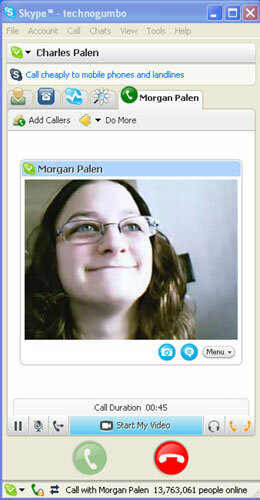 The best known computer based implementation of this paradigm is Skype. However, there are many other freely available pieces of software such as Google Talk(with plugin), QuteCom(formerly Open Wengo], Ekiga, and the most widespread; Adobe's Flash Player. Why did the video phone fail? There are a vast number of reasons to cite why the original video phone concept failed. Video phones were expensive, low quality, operated on proprietary equipment and protocols, had limited service ranges, required specialty training to service, and many more faults. The original video phone was an interesting and helpful device, but did not have the support structure to make it a viable commercial product. There have been many technologies throughout history that humanity has been capable of, but they have not been practical. At the turn of the century, Thomas Edison believed that the future of transportation was in electric vehicles; but battery storage did not make this plausible at the time; and the cost and range of combustion - based transportation was more practical. Around the same period Nikola Tesla successfully demonstrated wireless power transmission; but this was found impractical as well. How ironic that Intel and many other companies are focusing their research might back in wireless power transmission as we start 2009. The electric vehicle has also seen a coming of age as many of the major auto makers have decided it is now a viable mode of transportation. I propose that robotic telepresence, like wireless power transmission and electric vehicles now has a target audience that would be willing to pay for it. In order to provide evidence for this claim, we will investigate the telepresence industry and current robot telepresence offerings. The telepresence or perhaps better known as video conferencing industry has seen unprecedented growth in the last few years. Especially ironic is that growth is expected to continue throughout the current economic uncertainty brought by the crash of the housing market in early 2008. Forbes agrees with this statement in their October, 2008 examination of Cisco's telepresence division. "In its August earnings report, the company announced that its telepresence business had quintupled when measured against the year before, even as other parts of the IT sector were already starting to slump." I also want to excerpt another quote from the Forbes article because its outrageous claims are hard to believe. "An IDC report from last March projected that by 2012, the number of deployed telepresence systems like those sold by Cisco, HP, Tandberg and Polycom would grow from around 600 to more than 8,000 worldwide, and that revenue from those systems will increase tenfold, from $170 million to around $1.7 billion." There are many aspects of the telepresence industry that make it an attractive sector to gravitate towards in a downturn. Telepresence is a technology that actually saves money when incorporated into sustainable financial planning because it reduces travel costs (which have traditionally been rising). Telepresence is also an industry that relies heavily on technology and the Internet which has traditionally followed in Moores Law, gaining in speed and lowering in cost as time progresses. Telepresence is a growing industry that comes close, but not close enough in facilitating distant communications. Robotic telepresence is an extension of video conferencing technology in an attempt to enhance the immersion and capability of the technology while at the same time reducing cost to implement and maintain. There are many indicators which position robotic technology in a state of growth and increased commercial viability. The robotics industry has traditionally been an academic and industrial pursuit, but out of lowering costs and immense gains in capability it is rapidly becoming an industry to look toward for innovative products. The most telling evidence to back up this claim can be found as an audio excerpt from "Robots: 2008 New Year's Special" around 6:10 when Dan Kara of Robotics Trends highlights the economically strong areas in robotics, many which include telepresence technology. 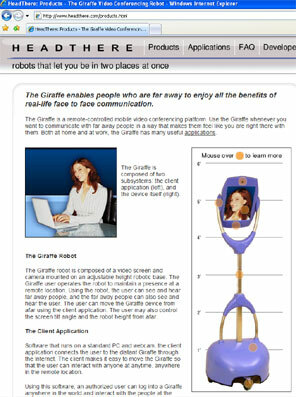 Another entry in the telepresence robot sector is the Giraffe from Headthere. It is supposedly a fully-functional platform that includes an automated tilt/pan video head; but the company website has remained largely unchanged for over a year. 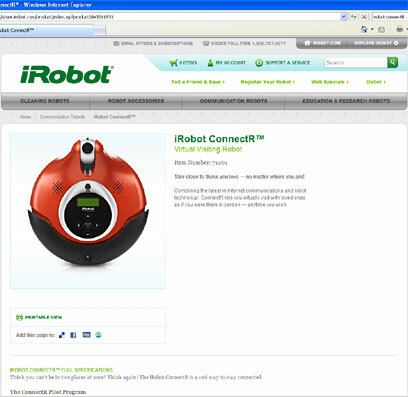 Recently, the persistent robotic toy maker Wowee released the Rovio, which resembles the Irobot ConnectR but has increased functionality. 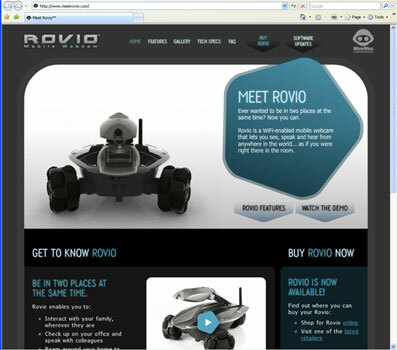 Rovio also incorporates limited artificial intelligence path finding capabilities in its ability to autonomously locate its' charging station. 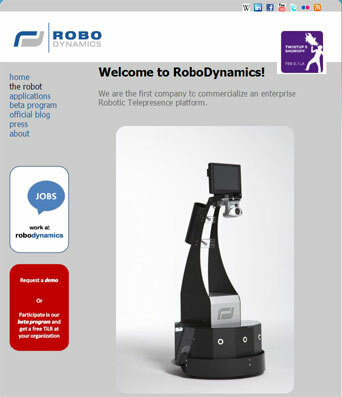 RoboDynamics TiLR robot has been demonstrated at a Google campus on video and is currently undergoing several beta trials in businesses across the United States. The TiLR platform gets a lot closer to the type of telepresence which allows dynamic embodiment of a person from great distances at a reasonable price. 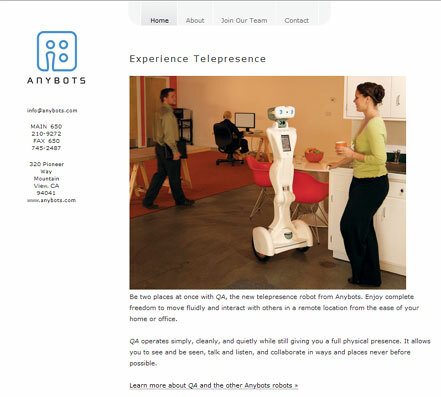 The company Anybots is also working on an inverted pendulum telepresence robot named QA. The web is also producing a variety of DIY telepresence robots built by hobbyists in attempts to extend traditional video conferencing technologies. Gizmodo recently published an article on a mac - mini and Skype based DIY robot which utilizes Skype's instant messenger capabilities to send drive controls to the motors of the robot while providing a quality face to face telepresence environment. There are several variations of the Iphone Robot, but this one allows the controller to record video from the device. My own work extending Flash by simply controlling a camera attached to a servo is a very basic example in this realm as well. The bottom line is that there are a wide array of examples coming out of every corner of the world from commercial to DIY solutions in telepresence robotics in an effort to enhance communication over great distances. There are three major paradigm shifts which share similarities to the experience a telepresence robot would provide increasing the likelihood of consumer acceptance. Not surprisingly, each of these technologies relies heavily on the Internet. The technologies are; Internet television delivery, interactive games online, and broadcast your-self services. There has been a major jump in the amount of free programming available online. Major networks including ABC, NBC, and CBS all provide up to six previous episodes for viewing at any time on the Internet. Shows are generally made available online the day after they air on traditional broadcast and cable networks. Although the majority of mainstream programming available online is from the major broadcast networks, there have been a slurry of all - online shows cropping up. The Revision 3 network is probably the largest all-online producer. Channel Flip is a newcomer that is catching up quickly. Even randomly searching I was able to find OnNetworks which hosts a vat of original online shows. There are also many niche webcasts that target shorter form (around 5 minutes) including Dr. Kirsten Sanfords' Food Science. The netcast This Week in Media "52 Inches of Evolving Fun" from October 11th 2008 discusses the matter of switching completely to online distribution of television. CNN has been offering a free live stream for quite a while now which hit a major technology mark serving at its peak 1.3 million concurrent live streams. Television broadcasting online is paving the way for consumer acceptance of live video on a new platform and shattering technology barriers at the same time. When viewing programs online, there are generally fewer advertisements and the picture quality is lower. Online viewing of television requires a high speed Internet connection; but as compression and decompression technology has increased it has alleviated the speed of connection needed and increased the quality of video offered. The technology behind the majority of web video sites is a combination of a media server most often utilizing compression technology from On2 and the Adobe Flash Player. It would be irresponsible at this point in time to claim that video games do not play a major part in most of the developed world. There is a direct relationship between the way that video games are played and how a robotic telepresence platform is controlled. Having experience controlling a character in a video game makes controlling a telepresence robot seem very familiar to the end user. 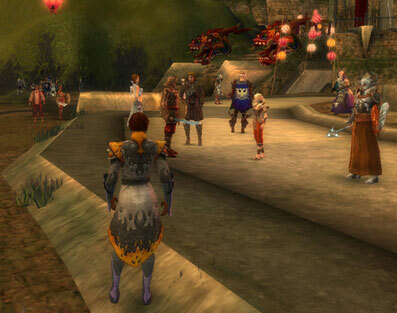 According to the statistics from many online games including Final Fantasy IX, World of Warcraft, and Second Life the amount of users participating in online worlds continues to increase. There are many ways to gage of the amount of people in the world partaking in massively multi player online games. Final Fantasy IX performs a census each year of its online virtual world. The 7th census shows more then 500, 000 users. There is also census data for perhaps the most popular massively multiplayer online game, World of Warcraft which only accounts for the last 30 days and characters over level 10 (which would take a significant time investment) Over the last 30 days only, the unofficial World of Warcraft census boasts over 6 million active users over level 10! Although Second Life is not necessarily a game, it is a massively multi player world that managed to capture the attention of many major businesses interested in an enhanced global communications tool. If you are not familiar with Second Life, there is an explanation on "The Lab With Leo #82" Second Life also reports a yearly census(2007) which seems to boast constant growth throughout 2007 and into 2008 noting "12,240,161" users at the end of January 2008. One of the primary reasons that business users are drawn to Second Life is the potential for enhanced communication. The Business Week cover story "My Virtual Life" by Robert D Hof, notes that over 200 companies including Intel, Wal-Mart Stores, and American Express have shown interest in Second Life as a way to foster more collaborative learning methods. There are a trove of wacky videos on YouTube that demonstrate business's attempts to utilize Second Life. [Search "Second Life Business"] In addition to the numerous videos there are also blogs like the "Business Communicators of Second Life" which target enhancing communication strategies for businesses inside Second Life. Linden Labs has been paying attention to the business users trying to leverage their technology with "Immersive Workspaces" . Which Silicon Alley harps is just an over-blown alternative to reliable established telephone and video-based conferencing solutions. So to summarize, Linden Labs, the company behind Second Life, has ultimately invested a great deal of their future on attempting to innovate teleconferencing solutions. Probably the most recent social paradigm of those already covered is broadcast yourself services. These allow anyone with a modern Internet connection and a camera to suddenly make live video of themselves available to thousands of people for free. 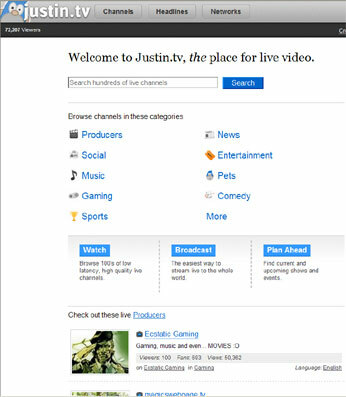 Justin.tv is one of the champion sites in this category primarily targeting average users. There are many other broadcast yourself services emerging which are targeted toward easily allowing professionals to live stream on the web. Stickam is one the the primary contenders in this arena. Qik even takes the concept a bit further allowing live streaming from a mobile phone. A comprehensive survey of the primary companies in this area can be found at Venturebeat in the article "14 ways to broadcast yourself live". These services are proliferating faster then trick-or-treaters on Halloween because they are easy to use, fun, and provide unique revenue opportunities. Air travel is a wonderful and for the most part affordable (considering that you are traveling thousands of miles in record amounts of time) experience for individuals that can use it. However the poor airline industry has major challenges to overcome as we trek hopelessly into the future. In 2009 it is now common knowledge that refined oil is a commodity that will only raise in price as it becomes harder to produce. The fact that air travel is proportionately tied to oil means that generic ticket prices can only increase. Air travel excludes certain segments of the population, there is an excess of social stigma concerning flight, flying requires the use of non-renewable resources, and increased global economic interaction is driving the need for better distance communication. Flight is a unique form of travel that excludes many potential customers from even giving it a chance because there is a vast cultural stigma that flight is dangerous. A good indicator of the amount of paranoia that exists among the general populous about flight is to search youtubeusing the term "plane". You will find that almost half of the videos are of plane crashes. Even searching a prominent general news site like AbcNews.com using the term "plane" returns many plane crash results. If you have ever flown before, you have seen people that have a hard time fitting into the seats. On many planes, even average sized individuals have a hard time fitting in the seats. The incentive for the airline is to pack as many ticket purchasing individuals onto a plane as possible, not ensure comfort. Jetliners are manufactured to accommodate average size individuals. This problem is echoed across every carriers' website in the form of official "Customer of Size" FAQ's. Current jet turbine technology would make it impractical to try and power an airliner on anything but highly refined combustible fuels. Its fathomable that biofuel could be used as a source of propelling a jet turbine, but the high cost of production is prohibitive at this time. As people become more concerned about the environmental impact of carbon emissions it is also likely that legislators may target airlines with increased fines such as the UK "Green Tax" according to "An airline industry wish list" USA Today Article. The same article mentions that at the 2007 International Air Transport Association conference(IATA) Director General, Giovanni Bisignani called for a "zero emissions" airline industry within the next 50 years; clearly showing the industry's concern for an intertwined relationship with oil. I hope that this essay has started to etch away at a reasonable argument for why a Consumer Grade Telepresence Robot is viable technologically and economically. Please feel free to leave comments, corrections, and criticisims in the comments. I dream of a day when I can utilize a robotic platform in order to increase the meaningful interactions that I can have with friends and family from half-way across the United States. Thanks Steve. That's very nice of you. Good stuff. This is interesting, as is your entire site.